Wow, one of the best single-show line-ups of the year currated by and staring Quasi, that had us ping-ponging between two floors so there was no downtime. (Though there was some, in my opinion, unecessary overlapping going on which was slightly annoying.) The last time I saw Sam Coomes and Janet Weiss was at NorthSix five years ago and I'd forgotton how good they are. This was also my first time seeing them as a trio (Joanna Bolme, who like Weiss, is also a Jick). Coomes spent a lot of time on guitar instead of keyboards which clearly he enjoys. And it's always a pleasure watching Weiss play drums. Perhaps following Quasi's lead, Sic Alps made their debut as a trio last night, adding former tour-mate and fellow San Franciscan Ty Segall on drums. Segall is a great performer in his own right, and anyone who's heard his great debut from this year knows he's a perfect addition to Sic Alps' sludgy, swampy garage rock. The band flew in from San Francisco just for this show and left behind The Monolith — their towering Jenga-like stack vintage equipment that is such a visual presense at their shows. But with Segall on drums, it freed up Matt Hartman to crank out all sorts of weird noises on his guitar and occasionally sing. Mike Donovan still scrunches up his face when he sings, as if someone is resetting his shoulder. For my money, it was the set of the night. An aside about the Monolith for you Sic Alps fans: Talking to Hartman after the show, he said that with Segall on drums in the space that the Monolith would normally be, it may now morph into more of a Wall. Sounds like they're gonna need a bigger van. Crystal Stilts' set in the Tap Room was marred by not-so-great sound and not having keyboardist Kyle Forester with them this time but it was still a good set. 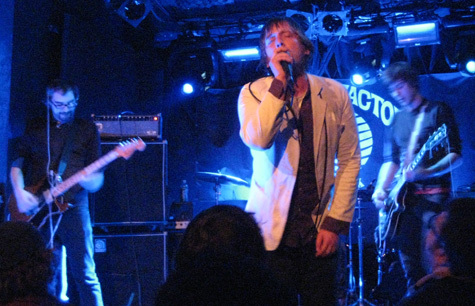 I've written about them enough this year so I won't bore you with more, but I did get video of a new song, the one that was called "poopface" on their setlist at Le Poisson Rouge. It's below. Somehow, this was my first time seeing blog-adored guitar-slinger Marnie Stern, who has been praised upon high by all the heavyweights. While I appreciate her energy, and it's fun to watch a cute girl doing Steve Vai style hammer-on guitar flourishes, she is just not my thing. 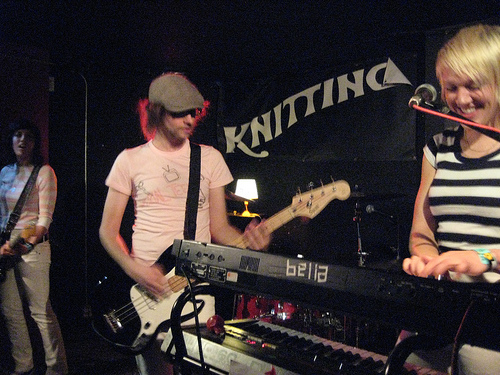 Neither was Soft Circle, which is ex Lightning Bolt and Black Dice drummer Hisham Akira Bharoocha. 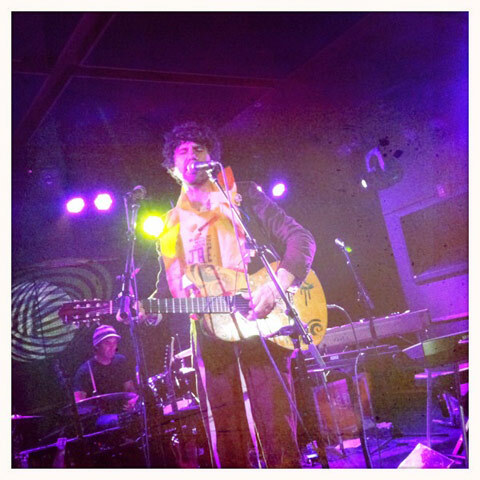 Like Andrew Bird, Liam Finn, Feist and others, Bharoocha uses loop pedals to be a one-man-band, building his creations from the bassline up… but he focuses on grooves, not so much songs. Which I think was my problem. He does it very well, but the songs don't really go anywhere, they just get bigger until he decides to stop. Wearing a ratty Watchmen t-shirt, Jeff "Jeffrey" Lewis opened the night with his charming, funny, thoughtful, absurdist folk and spoken word. He's a real charmer if you ask me, and we got a couple "movies," both of which were works in progress: "Low Budget Detective Flick" and "The Complete History of Communism in Korea." This was also my farewell to the current Leonard St. location of the Knitting Factory, which will close on New Years and reopen in February in Williamsburg in the former Luna Lounge space. The Leonard St locale opened just before I moved here in '95 and I've seen a lot of amazing shows there over the years: Wedding Present, The Fall, Jonathan Richman, The Chameleons… the list goes on. I hope they'll transform the Luna space into somewhere more pleasant to see a show. See ya in February. "Ok, now you try!" Slaraffenland were teaching the audience how to pronounce their name, which is Danish for "the land of milk and honey." It’s actually a little easier than it looks: "slah-rah-fen-land," with the emphasis on the second syllable. Slaraffenland are probably just as easy to enjoy as they are to pronounce. Which is to say imposing until you get the hang of it. Very little of their music follows pop conventions, but there is melody and beauty if you stop waiting for the chorus and just let the music wash over you. Live, Slaraffenland are pretty fascinating to watch, as all the members sing and play at least two instruments… often within the same song. The guitarist played the oboe; the percussionist played a variety of woodwinds; the bassist also played flute; and the keyboardist / sampler was often seen with a trombone. I’m sure the drummer also was a multi-instrumentalist but he was absent at Knitting Factory — a new father, he had to leave the tour early for daddy duty. Losing your drummer might seem like a dealbreaker to most groups but Slaraffenland didn’t seem to phased by it. There is a lot of live sampling going on in their show — many songs started with everyone playing horns which would become a backing loop — so live percussion blended with canned bits, and for a couple songs they were aided by tourmates Efterklang’s drummer. 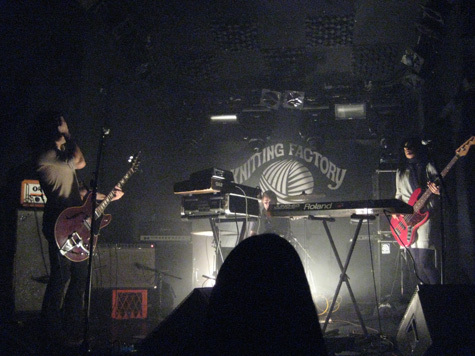 While not quite sold out, Knitting Factory was full with an enthusiastic and boisterous crowd. Slaraffenland seemed psyched too, but in that Danish way that makes exclamations like "we love you!" (which I’m sure was genuine) sound like maybe they’re being ironic. 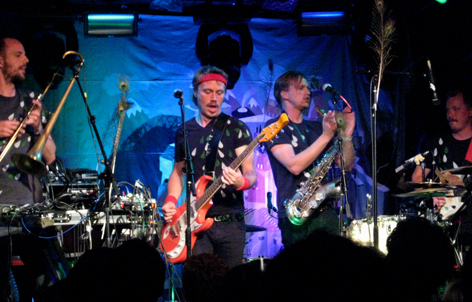 This was actually a Danish double-header with similarly-minded, though larger in numbers, Efterklang, which they dubbed the Danish Dynamite Tour. I must admit they were a little too affected for my tastes, both musically (a lot more precious and grandiose) and visually (they band wore turn-of-the-century garb, including those weird golf/riding pants that are baggy at the thigh and tight through the calf). 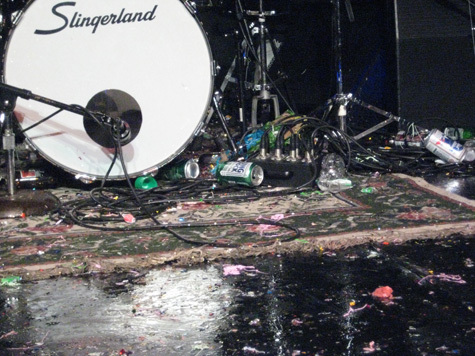 By show’s end, the Knitting Factory floor was covered in beer and hard candy and Silly String and confetti and paper mache. The stage was in worse shape. Five or six people were escorted out of the club. AKA just another Cheeseburger show. Actually this was wilder than most. The audience was drunker than the band, with people leaping on stage, grabbing the mic from singer Joe Bradley, who also got his shirt ripped apart. The reason for all the mayhem? The fifth anniversary of Jinners.com. In the pre-Brooklyn Vegan days, it was one of the best sources for upcoming shows and maybe the first blog I was really aware of. Jin’s also a band manager, and I’m pretty sure has about 20 other irons in the fire. She’s pretty hooked up. This meant a formidible lineup — Cheeseburger, Neckbeard Telecaster and The Big Sleep. (I didn’t see Coin Under Tongue.) She also brought party favors, consisting mostly of useful tchokies from her time at ASCAP — little notebooks for writing down setlists, flashlight pens for writing on them, and loads of earplugs. By the middle of The Big Sleep‘s performance a lot of those goodie bags had been torn apart to get at those earplugs. With their stark floodlights, smoke machines and their psychedelic riff-heavy jams, The Big Sleep are a sensory assault. I know a lot of people dislike them intensely but I really dig it. Neckbeard Telecaster are one of those bands I’ve been meaning to see for some time. All I knew was it was a side-project of Dirty on Purpose‘s Joe Jurewicz and that they were sorta country. What I didn’t know was that there were 15 of them and how awesome they are. "Joe’s got a policy that anyone who wants to be in the band is in the band," is what DoP bassist DJ told me, and the stage was proof. There were members of World Without Magic, the Jealous Girlfriends, Adam Franklin’s band, plus people I recognized from around Williamsburg: one of the baristas at Oslo, a guy who works at UVA wine, and like six more. All dudes. Beer flowed like water and whiskey flowed like beer. 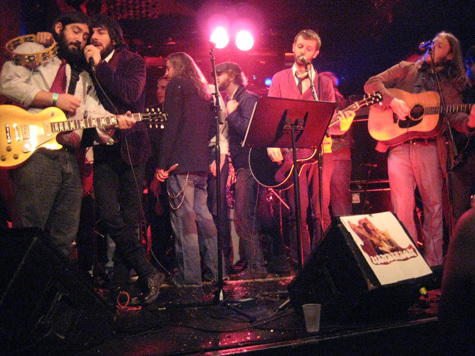 Drunken bearded dudes, yes, but a lot of talented musicians, sweet harmonies, good songs… the good vibes abounded. Since half the audience was onstage for Neckbeard passing around bottle of Jack Daniels, the crowd was good and primed for the rock-n-roll debauchery that is Cheeseburger. 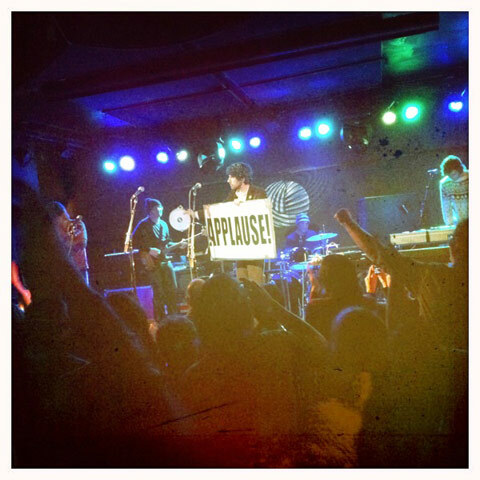 I’ve said before that they’ve gone from being known for drunken buffoonery to a genuinely kickass rock band… but Monday’s show seemed like a regression of sorts, although I think the guys were much less intoxicated than the audience. I spent so much time dodging thrown liquids, moshers, silly string, pinatas and the like that I don’t really remember much about the songs or the performance. But it was a whole lot of fun.